If compared with the electricity demand of countries in the same year, the cloud would rank 6th in the world, with demand expected to increase 63% by 2020. Each year, the electronic industry – one of the world’s largest and fastest growing – generates 9 million tonnes of e-waste from goods such as computers, mobile phones and tablets. 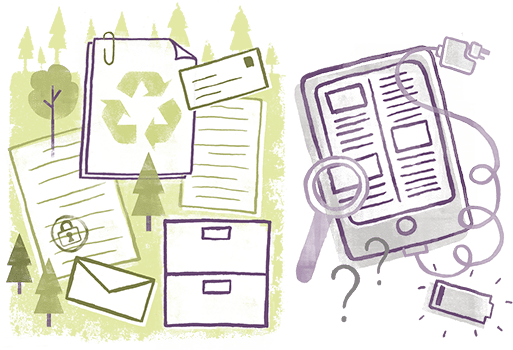 Two Sides advises businesses to be transparent about the carbon footprint of all their services. It is important to mention that not all greenwashing is due to purposely misleading customers. Often it is down to genuine and common misconceptions about Print and Paper. It is Two Sides’ role to educate both consumers and businesses alike. 6 Two Sides, 2016. FAO Data briefing document forest growth.